Despite being a fan of Roksanda Illincic, I wasn’t aware that she began showing her collections on the official London Fashion Week schedule in 2005. Style.com started featuring her in their fashion week coverage then. Vogue.co.uk, however, had featured her from the year previous. 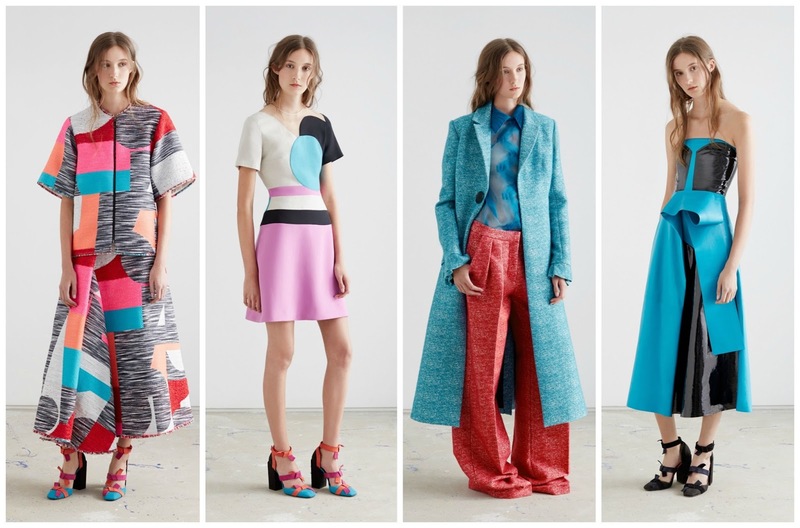 Looking back on her old collections you can see how Roksanda has refined what she knows best. She went from an eccentric to sensual to the Colour-Blocking Queen of London. Certainly not tied down by that label, she keeps things interesting season after season—she has to. Experimenting with texture, shape and colour all at once, her collections are improving season after season. Her Fall 2015 started out with brilliant looks but was let down with bemusing finale looks. Resort 2016, perhaps a teaser—albeit a more commercial one—to her next collection in September, exhibited the spellbinding effect that Roksanda possesses. A frayed edge skirt that caught my eye was bursting with colour. Peach. Turquoise. Pink. Red. Sand. A brushstroke black and white. The modern architectural sculpt looked beautiful. A turquoise tweed coat, the ‘Hindon’ coat, was another stunner within the collection. Featuring subtle lantern sleeves that would remind you of the Spring 2012, the coat will surely sell out. The viscose and wool dark rose suit in in the collection captivated me, especially against the electric blue fixture in the background of the image. The look references the cubist collages of Picasso. When I think of the colour-block looks Roksanda has done in the past I envision the sharply lined compartments of colour. This collection put a spin on that. Inspired by curves of instruments, signature pleats and folds and shapes were misshapen. The black, white and sand coloured ‘Tivoli’ dress featured curved lines (that had pink piping). Another dress had a turquoise and black circular on the breast. It brought the cover of Haruki Murakami’s novel Colourless Tsukuru Tazaki and His Years of Pilgrimageto mind. Certainly one of the best Resort collections that I’ve seen, the more you look at this collection the further you'll slip into a trance. Roksanda is a wizard. She can cast her spell on me any day.